The telltale signs of ice fishing excitability are out there. 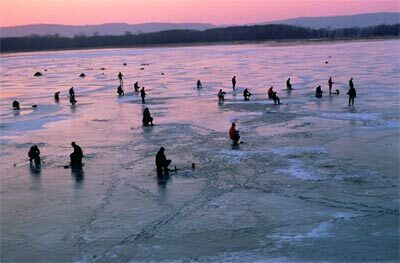 Anglers driving around their favorite lake with a spud bar or auger in the trunk, looking for signs of activity away from shore as their cue to get out and test the ice. "There is a lot of looking and driving around, but not a lot is being said," said Dan Fjeld, with the DNR's fisheries bureau at Clear Lake. Fjeld is getting a lot of phone calls from anglers who are looking for ice depths or fishing reports. Those reports are just now starting to trickle in, and in Fjeld's area he is hearing about crappies and perch being caught at Rice Lake. "I think there are a few guys that are going out, but not many," he said. He is seeing foot traffic on Clear Lake and expects fishing to start this weekend. More ice is being reported to the west at Spirit Lake, with anglers catching perch at Iowa Lake and Tuttle Lake, and a mixed bag at Anglers Bay on Spirit Lake, said DJ Vogler, with the DNR's fisheries bureau at Spirit Lake. The bays on West Okoboji Lake were beginning to freeze, but the main lake is still open. The first ice of the year is generally the strongest but anglers are reminded to use caution and check ice thickness regularly. As a general guide, at a minimum, four inches of ice is recommended for fishing, five inches for snowmobiles or ATVs, eight to 12 inches for a car or small pickup, and 12 to 15 inches for a medium truck. Ice thickness is not uniform on any lake or stream. Factors like wood or rock can conduct heat and make nearby ice weaker. Flowing water will also inhibit ice growth. Anglers should trust their instincts - if the ice does not look right, don't go out.